When Ava Crowley was just a toddler, she was diagnosed with neuroblastoma, a painful abdominal cancer that occurs in young children. After successfully treating the cancer with chemotherapy, radiation, surgery and stem cell transplants, Ava seemed to get better. But then her cancer came back. During this second battle with the disease, Ava’s parents decided to fly with her from their home in Miami so she could be treated by neuroblastoma experts at Memorial Sloan Kettering Cancer Center in New York City. That’s when they first discovered the Corporate Angel Network, a nonprofit group that pairs cancer patients and their traveling companions with companies that have extra seats on their corporate jets. The flights are completely free. 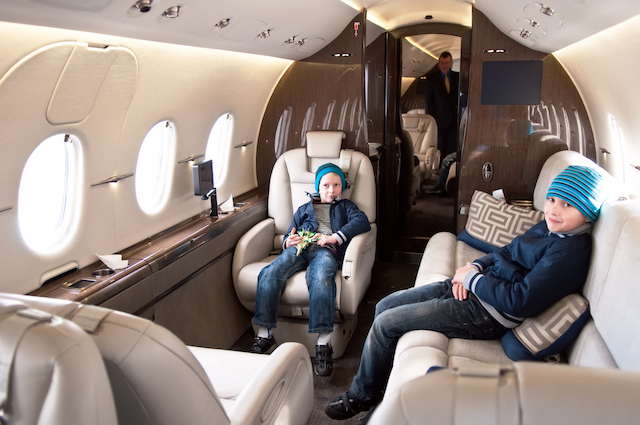 Ava, who is now 7, and her parents Spencer and Nickelle Crowley have flown 10 to 12 times through the Corporate Angel Network, which has saved the family tens of thousands of dollars and has made flying after treatment more comfortable for Ava. The family doesn’t have to go through the time-consuming commercial boarding process and they’re able to fly in a cleaner environment with fewer germs, which is important because Ava’s immune system is compromised. 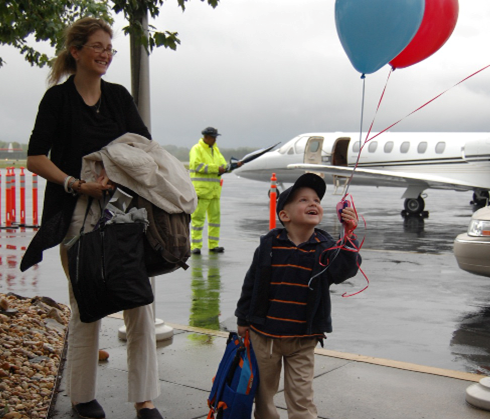 “We needed a ride home, ideally a ride for a child who had just endured a major surgery, a ride that could be more comfortable and relaxing than commercial,” said Nickelle Crowley, describing the first time the family flew with the Corporate Angel Network. Flights for three people from Miami to New York and back are not cheap, she said. She estimates flying with the Corporate Angel Network saves the family roughly $1,000 each time Ava needs to fly to New York. The network, which is based in White Plains, New York, was founded in 1981 and has coordinated more than 50,000 flights across the country with 500 companies. The organization arranges free travel for cancer patients, bone marrow donors and bone marrow recipients of all ages. Patients must be traveling to a recognized treatment center to receive treatment, a consultation or a checkup. They must also be able to walk up the steps of a corporate jet without assistance and must not need oxygen, an IV or in-flight medical assistance. Children can fly with two adult companions. Adult patients are allowed to bring one companion, who can help with logistics and recovery after treatment or act as a second set of eyes and ears during a consultation. Anyone, regardless of their financial status, can fly with the network. However, 80% of patients who work with the organization are in financial distress, said executive director Gina Russo. Businesses participate because it doesn’t cost them anything to give back in a way that makes a huge difference in someone’s life, Russo said. Some corporate executives chat with the patients and their companions, while others may have meetings in the sky and don’t have as much time to talk, Russo said. The Crowley family finds many executives are glad to meet Ava and hear her story. Some have contributed money to researchers and organizations looking for a cure to childhood cancer. On the organization’s 50,000th flight, technology company NCR Corporation flew an 18-month-old boy with eye cancer from New Jersey to Atlanta. “Giving back to communities in which we operate is interwoven in the fabric of NCR’s 132-year, rich history,” said Andrea Ledford, an executive with NCR. The Corporate Angel Network works with national cancer and medical organizations to spread the word about its free service. Patients are allowed to travel as much as they need through the network, though the organization cannot guarantee a flight during the time the patient has requested. The network has a 50% match rate, Russo said. The network will try to fly a patient to an airport that’s within 100 miles of where they need to go. Destinations tend to be major U.S. cities like Chicago, New York and Washington, D.C., because that’s where many medical specialists are located. However, the network also flies to smaller cities to pick up and drop off patients. “We are mindful to make sure we have routes even where a treatment center might not be based but where a patient lives,” Russo said. The number of times each patient flies depends on the person’s cancer and treatment schedule. Some fly once or twice, while others may fly a dozen or more times because they’re participating in a clinical trial that requires frequent visits to a hospital or research center. “We’re able to help as many people as possible, regardless of their situation or frequency,” Russo said. Your Turn: Did you know some companies share their corporate jets in this type of program?